All the given formats of font’s should be in folder. That folder names must be the font name. Font file name should be slug type of folder name(font folder name). 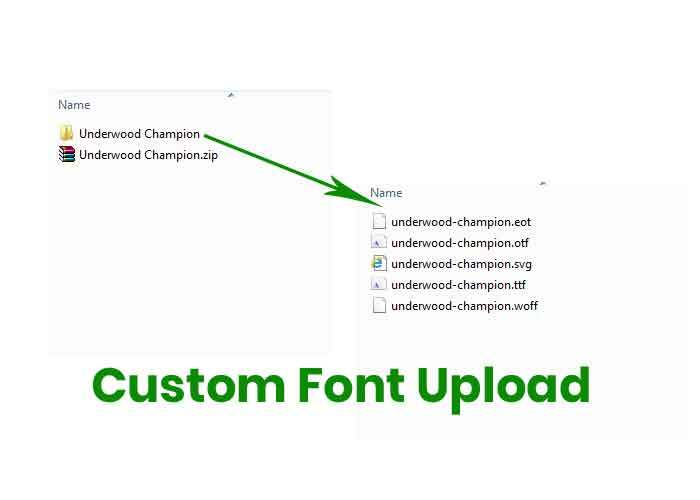 Example if font name is “Underwood Champion” then inner font files name should be underwood-champion.eot, underwood-champion.otf, underwood-champion.svg, underwood-champion.ttf, underwood-champion.woff. Same thing shown in this post image. If you have doubts please click following link. Here we added sample font zip file.